Bellerophon is one of the world’s oldest working steam locomotives. The locomotive was built in 1874 by the Haydock Foundry, to the design of Josiah Evans, son of Richard Evans who owned the Haydock Collieries. It was one of the third of six similar locomotives built by the Foundry. The modified outside Gooch valve gear looks strange to those familiar with modern steam engines. Bellerophon’s duties included twice daily runs between Haydock and Northwich in Cheshire and, alternately, twice daily runs between Golborne and Edge Green collieries and the shunting yards at Haydock. This involved running over the mainline railways, as in the 19th century private companies often exercised their running rights in this manner. In the 1880s, Bellerophon and her sister locomotives ran annual passenger excursions to Blackpool for colliery employees and their families. Four trains, each double-headed, made the journey over the lines of the LNWR and LYR. When the coal mining industry was nationalised in 1947, the Haydock Foundry became the Central Works for the National Coal Board St Helens area and continued repairing colliery locomotives and rolling stock. Bellerophon received its last overhaul at Haydock in 1957. It then worked with little or no maintenance until 1964, by which time it had been at work for 90 years. The five other similar Haydock locomotives were cut up for scrap in the early 1960s leaving only Bellerophon, which was donated to the Keighley & Worth Valley Railway in November 1966. It was seen as being of little use for hauling the heavy trains of this popular heritge railway and so became a static exhibit at Haworth. Then Terry Sykes, a member of the K&WVR, came up with a plan to restore Bellerophon to working order. The Vintage Carriages Trust purchased the locomotive from the K&WVR for a nominal sum and successfully applied for a 50% grant from the Science Museum towards the costs of restoration. Bellerophon steamed for the first time in preservation on 1 May 1985 and hauled its first passenger train in about 100 years that October. In 1986 it won the National Coal Board’s “Steam Heritage Award”, and in 1987 began a tour of many preservation sites around the north of England, including Steamtown, Carnforth, Crewe Heritage Centre and the Embsay and Bolton Abby Steam Railway. It was also deployed on off-peak services on the K&WVR. In 1989 the locomotive’s restoration won the Institution of Mechanical Engineers “Heritage Hallmark Award”. To enable Bellerophon to be seen working in an authentic colliery railway setting, the Vintage Carriages Trust loaned the locomotive to the Foxfield Railway. Here after a decade of hard work another major overhaul was commenced. 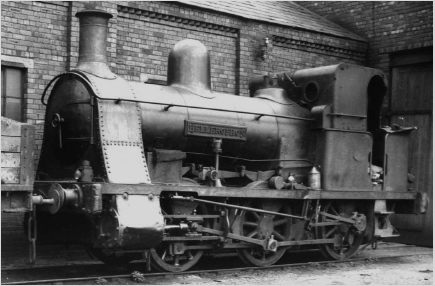 The restoration was completed in time for Bellerophon to be the star attraction at the Foxfield Railway’s Steam Gala on 19 and 20 July this year. It was, of course, a party of Foxfield Railway volunteers who acquitted themselves so well repairing track on the Smigiel Railway in Poland earlier this year. This entry was posted on Tuesday, 5 August 2008 at 00:53 and is filed under Uncategorized. You can follow any responses to this entry through the RSS 2.0 feed. You can leave a response, or trackback from your own site.